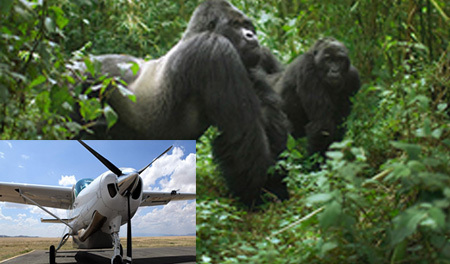 This flying safari takes you to Bwindi Impenetrable national park to track mountain gorillas, birds watching and other primates in the forest. There are 2 flight schedules leaving Entebbe to Bwindi impenetrable national. After breakfast, proceed for the morning briefing before enjoying the highlight of the trip- Gorilla trekking, which may last the entire day. We trek the gorillas through the rainforest and bamboo covered slopes, accompanied by a guide and trackers, in search of a mountain gorilla family. The walking can sometimes be tough and long, but when you catch a glimpse of the magnificent silverback, any discomforts will be quickly forgotten. When the gorillas are sighted, visitors will be guided to within 6 metres from the gorillas, sit around them for a whole hour while gazing into their big round eyes. Early breakfast before embarking on our return to Kampala, your driver/guide will transfer you in time to the airfields either Kisoro at 09:10am or Kihihi at 09:45am to catch your flight back to Entebbe and we shall reach Entebbe at 11:25am. Up on arriving at Entebbe, you will meet us there to transfer you to a nearby hotel Entebbe as you wait for flight at night. Please note that all international flights require 2 hours prior to departure.